Very nice! What exactly is a Doomblaster? I think this is a vast improvement, and a great looking war machine. For discussion's sake, do you have a small blurb about how they shoot and fire? 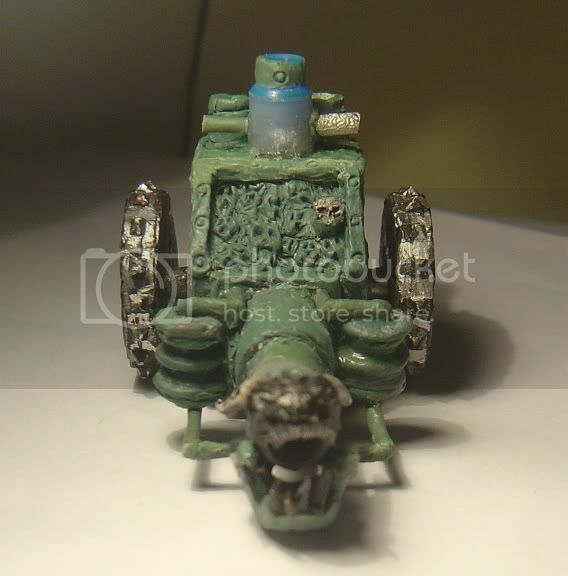 Is the hull all green stuff or does it have a filling(apart from the skull). Everything that looks green is greenstuff. 1. Neaten up the rivets and plates they lie on. 2. Make the barrel more circular. 3. Add another, rivetless plate to the top of the barrel. 5. Make the sticky-out bits from the main chimney into pipes. 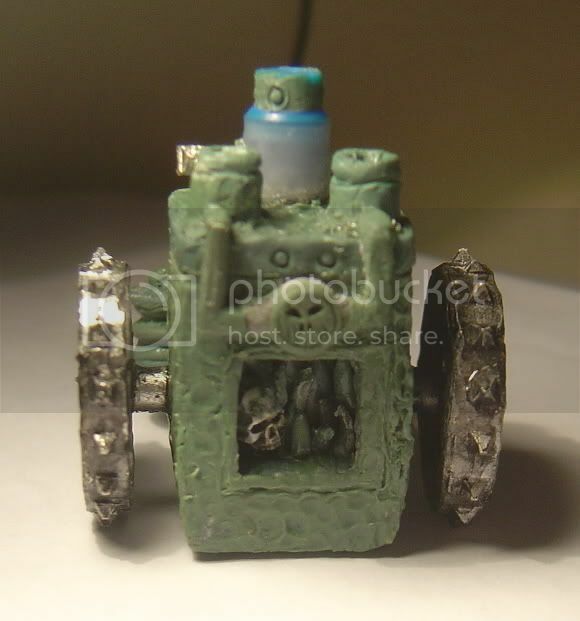 The smaller cousin of the Hellcannon, the Doomblaster uses the souls of slaves or captives to fire a stream of screeching, mutating energy, the very stuff of chaos. Only those with an innate resistance to the warping power of change or with a particularly tough constitution can survive being hit by the Doomblaster, whilst their less fortunate comrades are churned up and torn apart from within by unnatural growths and twisting bones. How is it aimed, or how does the arc of fire changed? Can't wait for more work to be done. From what I can remember from his Army Book, it's a little like a Bolt Thrower. That thing is hadrcore. Great work Rev. It is aimed as all warmachines are (in terms of arc of fire. I.E. You turn the model to point it in the direction it'll shoot). It is looking awesome and a vast improvement upon the older version of it! Ya I agree with Xander it does look like it's going to shoot the ground. So you might want to change the name to earth shacker. Oboudd, your attitude has been consistently negative. That will not be tolerated at CDO. CDO fosters a welcoming and open minded environment geared to help fellow users not insult them. If you meant it as a joke, I would say you haven't yet earned the right to joke about such things as your attitude has been nothing but poor. Ohhh very nice work you got there! 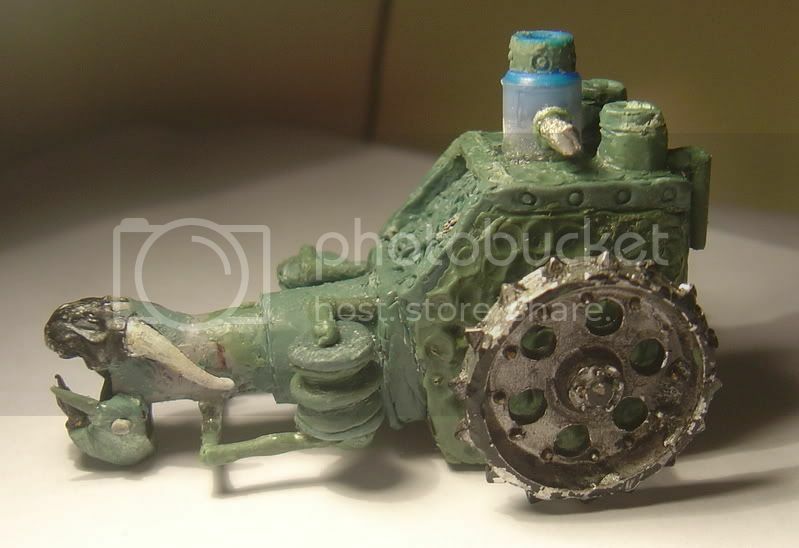 :O I'm really impressed how you made all the details to really inspiring, have you already painted this cool machine?